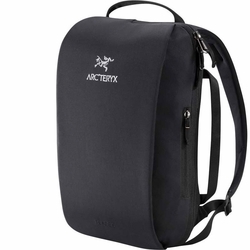 ARCTERYX Blade 6 Backpack. Compact daypack with refined, clean styling. Created to carry smaller laptops, tablets and core essentials. The Blade 6 is an example of the Arc’teryx commitment to refined, use driven design. Created for ease of passage through the urban landscape, this streamlined pack carries core daily essentials including a small laptop and tablet. Its clean, low profile is easy to maneuver on bike commutes, crowded trains and as an airline carry-on. Sizing & Buying Tips: Need help? Check out our handy Buying Guide. Click here. Volume: 6 L / 366 cu.in.